Exchanging weddings bands is just as important and special as exchanging vows on your wedding day! 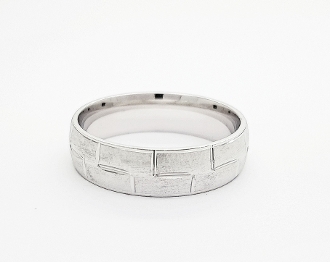 These sterling silver hand engraved geometric style rings have a brushed finish to make for an intricate and unique ring. Get your hands on these one of a kind wedding bands for your one of a kind day! Add your own special twist to these rings by choosing to engrave them. These bands are available in both his & hers sizes.